More ORFs than previously thought are interacting with ribosomes. As scientists peer ever more deeply into a cell, the picture of how things work becomes more and more complicated. This was true when scientists took a hard look at transcription and gene regulation and found lots of little RNAs scurrying around the cell, regulating genes. And it now appears to be true for what is being translated and how translation is regulated. In a new study, Brar and coworkers used ribosome profiling to explore what happens in yeast cells during meiosis at the level of translation. What they found was that a whole lot more was being translated (or at the very least gumming up the translation machinery) than anyone expected. They also found that translation is as finely regulated as is transcription. 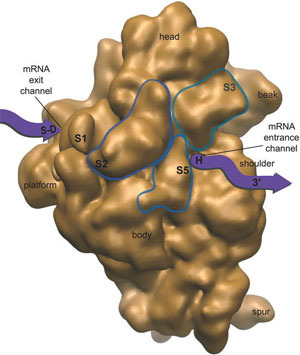 In ribosome profiling, scientists determine what RNAs are contained in a ribosome at a given time point. The basic idea is that they isolate ribosomes, treat them with nucleases and then harvest the associated 30-35 nucleotide long mRNAs. They then sequence all of the isolated RNAs and identify where they came from. Like lots of biology these days, this technique has only become possible with the advent of cheap, robust sequencing. In fact, the size of these sequences is ideal for modern sequencing techniques. Researchers in the Weissman lab are finding all sorts of interesting things using this new tool. For example, in meiosis they were better able to determine which proteins are involved at various stages of meiosis, to see how involved “untranslated” mRNA leaders are in translation, and to identify smaller, previously ignored transcripts associated with ribosomes. In this post we’ll just focus on the last point but encourage the reader to learn about the study’s other findings here. Ribosome profiling has revealed that a lot more is being translated in yeast than the standard set of genes identified in the Saccharomyces Genome Database (SGD). For example, Brar and coworkers found that the mRNA of many open reading frames (ORFs) shorter than the usual 250 or so base pairs were associated with the ribosomes. Shorter ORFs like these aren’t routinely thought of as genes and so have not been extensively studied. However, given how many of these ORFs were associated with ribosomes, scientists probably should start paying more attention now. Even before meiosis, 5% of the ribosomes tested in yeast contained RNAs from these shorter ORFs. Once meiosis kicked in, the number went up to an astonishing 30%. Since scientists have only just started to focus on them, it isn’t surprising they don’t know how many of these smaller ORFs are translated into smaller peptides. Or what any of these peptides that do get translated might be doing in a cell. In a recent study, Kondo and coworkers have shown that one of these ORFs is translated into a peptide and proposed it affects how the transcription regulator Shavenbaby works in Drosophila. Work similar to this will need to get underway before we have a good handle on what exactly is going on with these shorter ORFs. Whatever they turn out to do, these small ORFs will probably change what we consider to be a gene. Again. The cell just keeps getting more and more complicated! Lengthy but informative lecture on ribosome profiling.